This rather scruffy looking pile is a lot of hard work. It's a bit of a story as well. You see, I have a bit of a problem with my Mexican Milkweeds. They're a little bit of an obsession. I plant them simply because the Monarch Butterflies like them. A bit too much. Quite a lot, actually. It's their main food here. I'm also a short walk from a little pocket park that is devoted to Native South Florida Plants, M.E. DePalma Park. There are a lot of flowers planted there that belong there. You know it's native because you are told - most of the flowers are not at all showy like you're used to seeing at the garden center. Walking past that park, you actually can HEAR the difference since all the local insects and animals are happily living in what they've adapted to - native species. 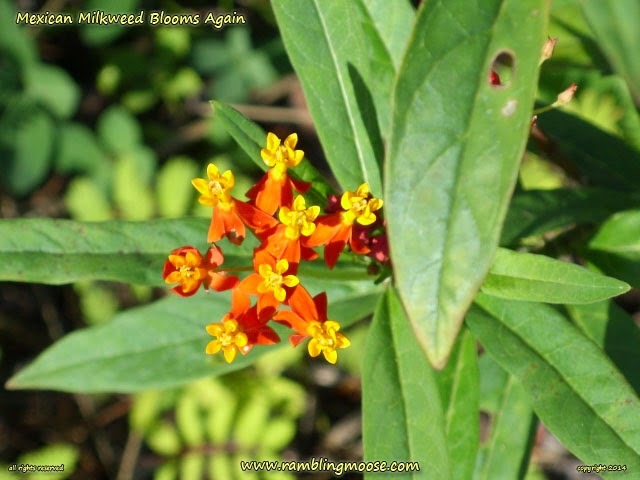 In fact, the Mexican Milkweed flowers are one of the larger ones there by virtue of them being a cluster of flowers. 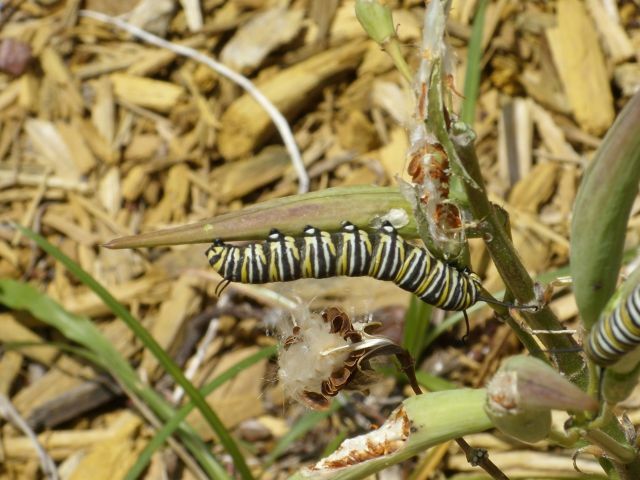 They're also very tasty to Monarch Butterflies. We have quite a few of them flying by the house as a result. 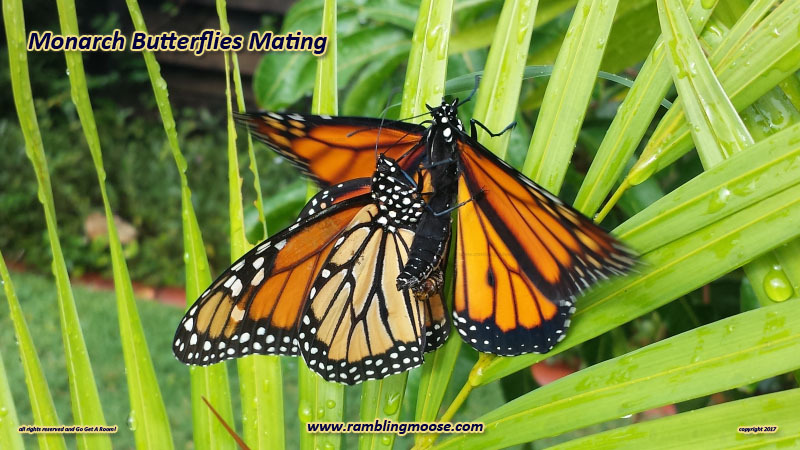 The butterflies know they are there. I'm not certain how, but if your main food plant is important to you you will learn how to pick them out. And that would be the crux of the matter. I normally can't keep them growing here. leave and the caterpillars will com out a few days later. Those caterpillars will eat the plant to sticks. You can propagate those sticks if you take a finger length cutting with one or two leaf buds on them, and stick them into moist soil. This time though, I was able to get a couple plants to grow to maturity. The Monarchs did not find them. It seems that the trick is that if your Milkweed is growing in a sheltered area, the butterflies can't really find them. As a result of all that dancing around ... 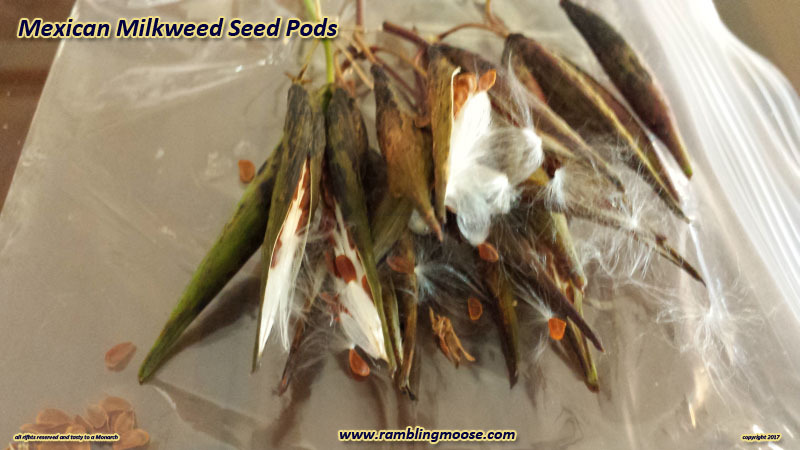 I finally have seeds enough for myself, the people who have been supplying me, some to return to the park, and a few to hand out to friends. The seeds grow quickly and flower fast, but only if they are not seen. The plants don't have any evil smell to them so they would grow indoors in a bright window, but you can't grow indoor plants in South Florida. Ants would find them and all the sudden you have a colony living in your living room. Nope. No indoor plants here. So my seeds? They're happily drying out in my living room. I'll be taking a pod with me on one of my many walks. I can go back to being Johnny Milkweed Seed. I may even get some more since there are a few pods that have yet to ripen. But ... we won't tell the Monarchs that, will we?